I spent a good chunk of Sunday tinkering with the GSXR ready for the coming weekend at Pembrey. 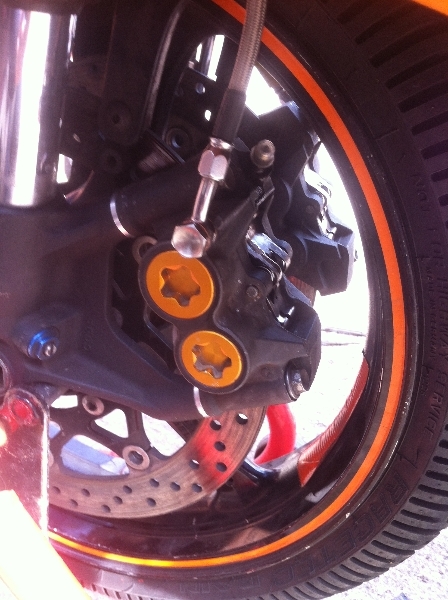 I finally got to fit the R6 calipers to the bike. This was a little bit more time consuming than I had thought it would take. I got the required spacers from a person on TDR forum and they required a little turning down to make them fit and to get the lugs out of the forks. I didn’t have the necessary tools to do this so I enlisted the help of a mate of mine to do this. Using a very much a measure lots and cut once it took a good long time. That said I am happy with the results as they really are a snug fit. The other reason to go to my mates garage was to do a few bits on the van. One issue was get a working speedo and fuel gauge. It’s a common problem on the VW T4 that a connector corrodes on the speedo and just needs cleaning off, how that effects the fuel gauge is beyond me but it does and that is thankfully what it was.